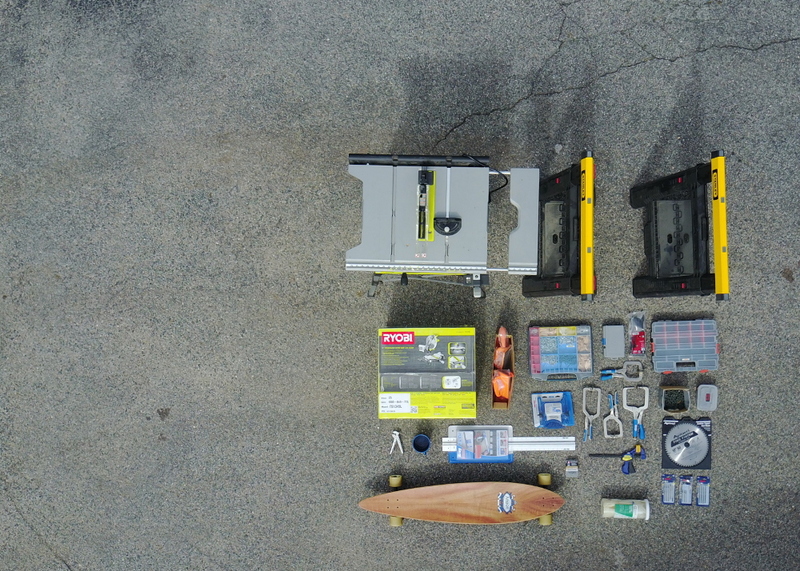 Here are some answers to the most common questions that we have been asked about our van build. If you have any questions that aren’t addressed, feel free to ask them in the comments below! Should I get a 4×4? Why convert a van yourself? What would you add to your van? Do you wish you had a toilet? Why did you choose a cargo van over a RV, regular vehicle, bike, truck & trailer, etc? In past, we had always gone on road trips using the vehicle we already owned or, if we were traveling to another country, we rented the cheapest car available upon landing. However, when we were dreaming up the idea of traveling around the country, we both still had full time jobs and envisioned the trip being more long-term. Philip wanted to keep his job, so, rather than use vacation for the trip, we decided to get a cargo van and convert it into a comfortable space to workout of. Why did you choose a Ford Transit over a Mercedes-Benz Sprinter, Ram ProMaster, or Nissan NV? At the end of the day these vans are all fairly similar and any of them will work for converting into a camper van. We had many reasons for why we chose the Transit, but here are a few of the simpler reasons that first come to mind. . .
We test drove all four vehicles and found the NV to be the most comfortable to sit in. However, the NV had the least amount of power (struggled on uphill driving in the flat part of Maine), which was surprising, considering that it has the largest engine out of all of the brands. Additionally, the shape of the vehicle looked like they had just added a roof to a pickup truck. Not much thought appeared to go into the design of the NV and that the company just wanted to have something to offer in the cargo van market. The nice thing about the other cargo vans is that, because the fronts are so stubby, you can see the road easier, making the vehicle feel easy to drive, despite their size. The Sprinter and Transit felt pretty similar on comfort, but Sprinters cost quite a bit more than Transits. 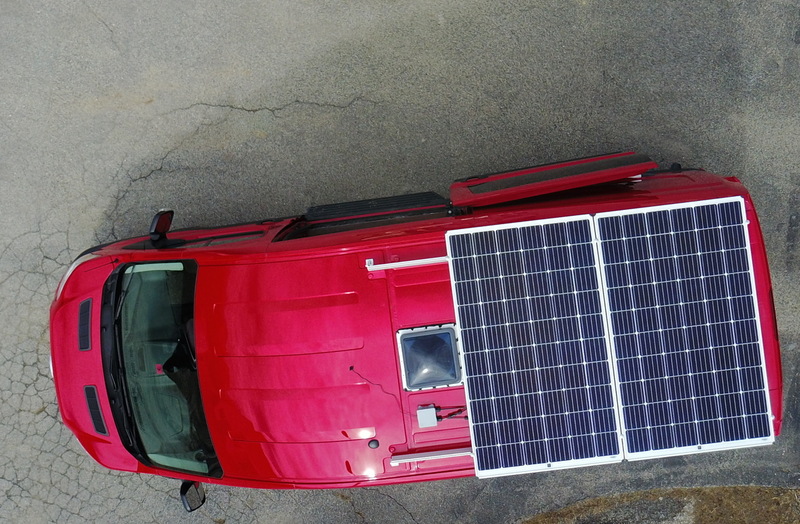 Additionally, we read a lot of warnings on forums about the sensors in Sprinters being finicky and expensive to replace, thus, making the cost of ownership a lot higher than the other three cargo van options. Sprinters also have the largest used market because they have been being sold in the US for so much longer. But, people are charging quite high amounts for a vehicle that has 200,000 miles+ on them. That said, if cost weren’t a factor and we were buying a new cargo van, we would, likely, choose the Sprinter. When we test drove the ProMaster, we found it extremely uncomfortable to sit in. We told this to the sales representative who explained that he had been trained to say, “the seats are designed for improved ergonomics.” Just the fact that he needed training on what to say about these seats, is probably not a good sign. However, the ProMaster is the widest. So, if you want to be able to sleep perpendicular to the length of your van, you have the best chance with the ProMaster. Additionally (excluding the NV), the ProMaster is the cheapest. The Transit is the best bang for your buck. We lucked out and found one used that had cruise control and a high roof, otherwise, we probably would have been buying a used Sprinter. One challenge with repairing a high roof cargo van is finding an auto shop that has a tall enough garage for it. Unlike Mercedes-Benz, Ford has a large number of mechanic shops all around the US, so it is easy to find one close by. However, we have found that most of Ford’s auto shops don’t know how to properly maintain/repair their Transit cargo van. One shop didn’t inflate the tires properly after a tire rotation (even after we had told them what the tires needed to be inflated to), resulting in the handling of the vehicle feeling very off for a couple of days before we checked the tire pressure. Not necessarily. When we were first looking into buying a van we really liked the idea of having a 4×4 cargo van. We figured it would be able to get us more places. However, after all the time and money we put into our van, we quickly realized we probably wouldn’t want to drive the van to places that needed 4×4 anyways. Plus, cargo vans don’t make very good off-road vehicles and having 4×4 capability adds ~$12,000 to the cost of the vehicle. However, if you envision yourself driving in snow and sand a lot, you may want to consider a 4×4. What type of car insurance do you have? Allstate, but we don’t have their regular auto insurance. Instead, our van is insured as an RV, which covers the van and the contents that are permanently fixed inside. This costs us $1,500/year. September 4, 2017 – Finished the conversion! What was your most important tool? It may sound a little corny, but having a second person to work on the van with. 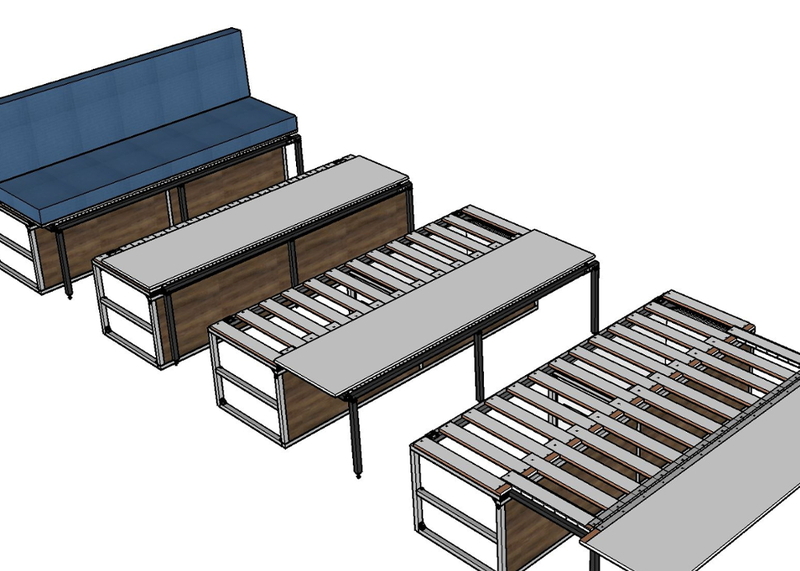 This allowed us to divide and concur; for example, Philip was responsible for electrical work and I was in charge of designing and building the couch/bed. This allowed us to each “specialize” in certain aspects of the conversion. For example, one of us may have learned how to use a tool one day and would teach the other the next day. If either of us were struggling on our personal project, we would bounce ideas off the other person, allowing us to make a decision and move forward. Additionally, when we became tired, we were able to stay motivated and stick to our high expectation on quality, knowing that the other person would have to live with our carelessness. What was the biggest challenge in converting a van to a camper? We are both engineers and slight perfectionists, so choosing progress over perfection was really hard. One of the biggest mistakes we made was staining the wrong side of one of the ceiling panels and not realizing it until after it was urethaned, so now we have a panel that is slightly darker than the rest. This was a mistake that no one has noticed until after we have pointed it out, but, at the time, was hard to get over. Oh, and converting a van in the winter, not because we were cold, but because our materials didn’t like the cold. 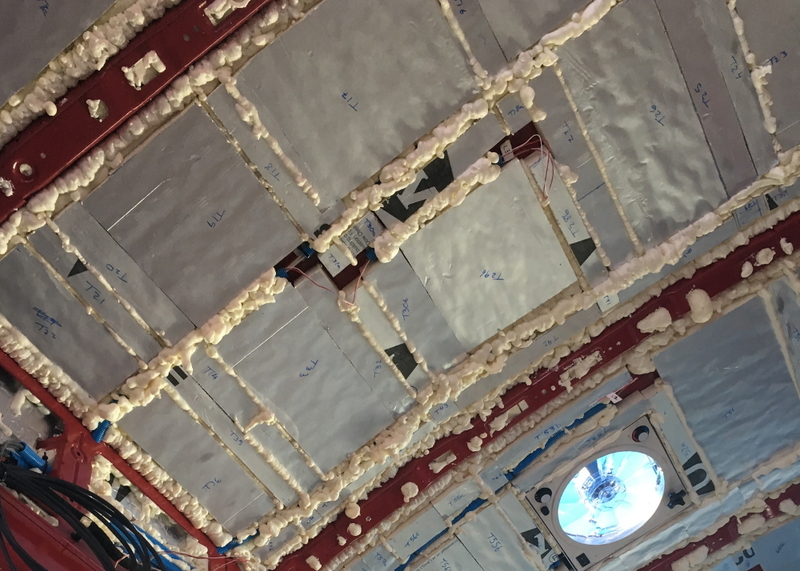 We would have used all Tiger foam sealant, like my co-worker Jim had suggested, instead of Polyisocyranerate, when insulating the van. We made our decision purely off of R-value, forgetting to consider labor. 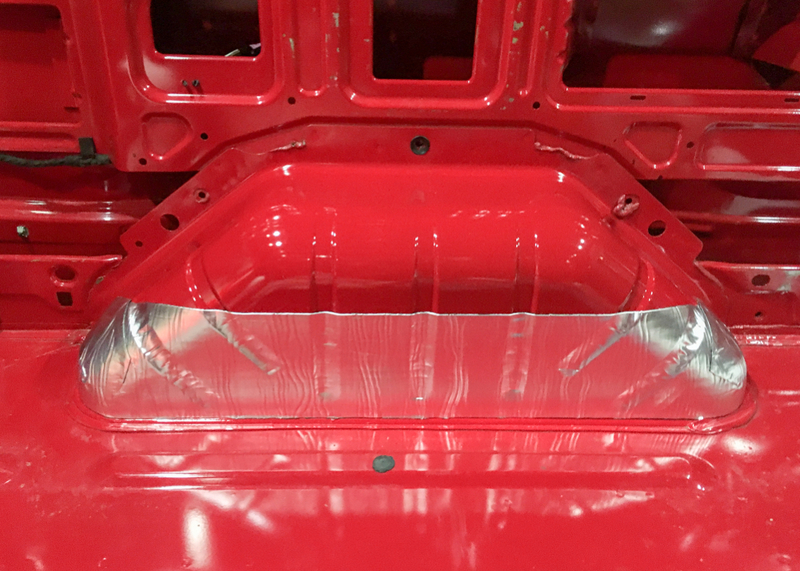 Cutting each piece to fit into small crevices in the van was very time consuming and resulted in a project that should have taken two days, but, instead, took a week. Additionally, there are some smaller things we would have done differently, which we discuss in the “Improvements” section of our “How To” pages. Why did you convert a van yourselves instead of hiring someone or buying a prefabbed van? The initial reason was that it is a lot cheaper to convert a van yourself than hire someone else to do it for you. To buy a fully converted van, it costs ~$115,000. But, what really turned us onto the idea of doing it ourselves was the the experience behind converting a van. 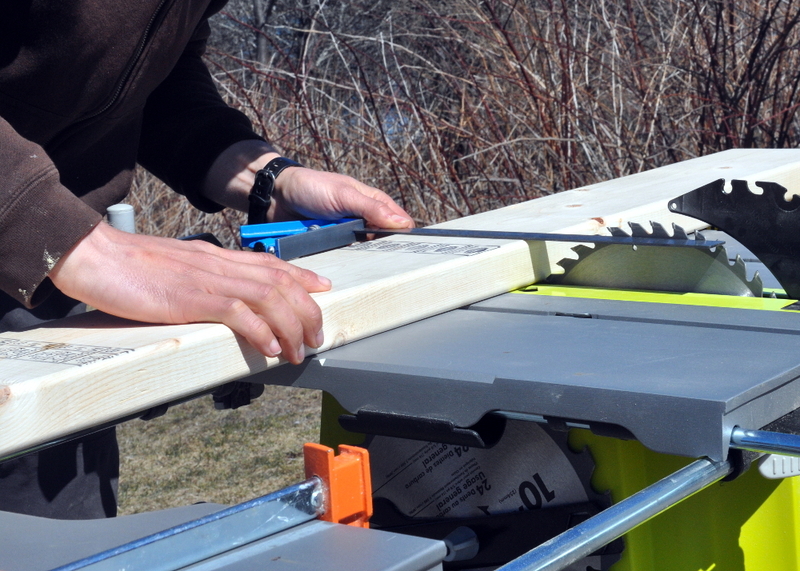 Neither of us had ever worked with most of the tools that we used and had only done basic woodworking, at best. So, we wanted to learn some new skills along the way. 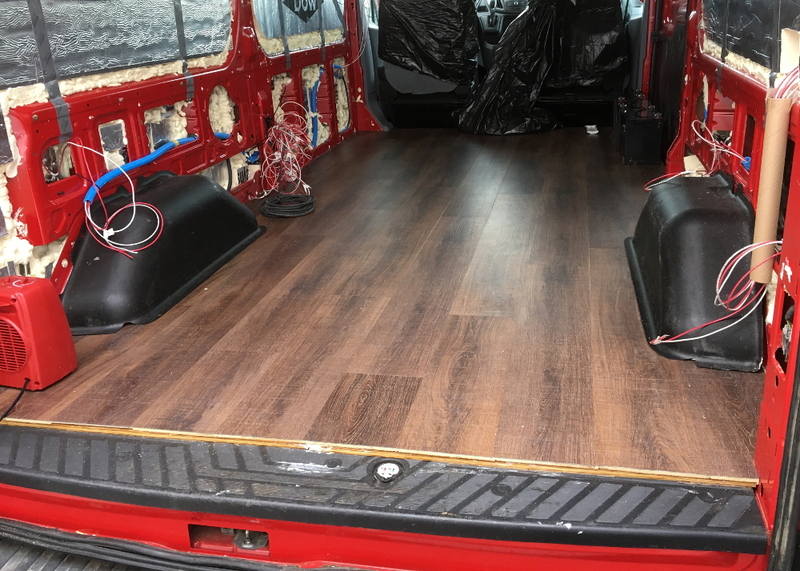 The cool thing about converting a van is that it involves electrical, plumbing, installing flooring, etc. These are all skills that you can use in repairing or building a house someday, but you are learning them on a smaller more approachable scale. Plus, if you have converted your own van, you know the ins and outs of it and, thus, know how to fix it if something goes screwy. A heater. The biggest concern with not having a heater is having the plumbing pipes freeze and burst. Our van stays relatively warm from body heat and thermal insulation, but, if we aren’t in it, it can become quite cold. So, having a heater would allow us to explore colder places during the winter. Our reasoning for not adding a heater up front was that we had never lived in a vehicle for an extended period of time (beyond road tripping a couple weeks at a time), so we weren’t sure if we would like it. 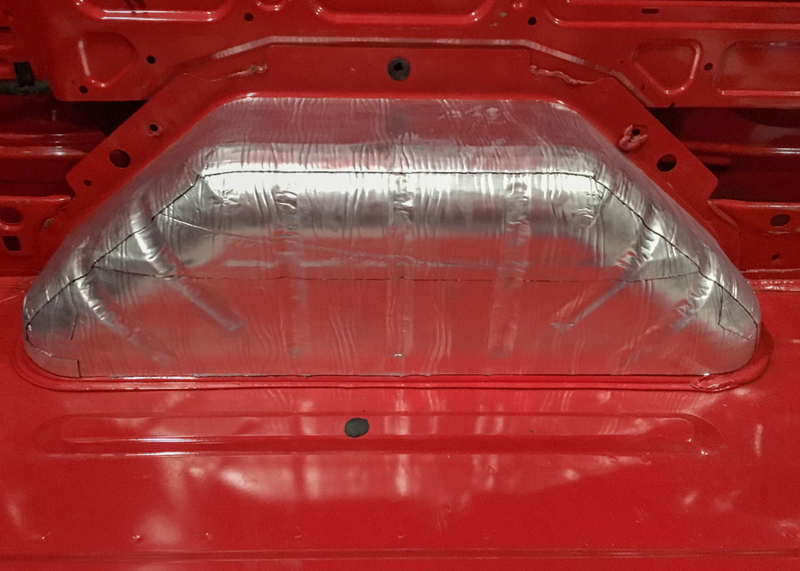 Because of this concern, we didn’t want to spend all of the money on our conversion upfront and a heater was a more expensive item, that was easier to add later on down the road. What do you have for driving in snow? Nokian Hakkapeliitta CR3 snow tires, diamond tire chains, Black Diamond collapsible snow shovel, and 60″ telescoping snow brush/ice scraper. 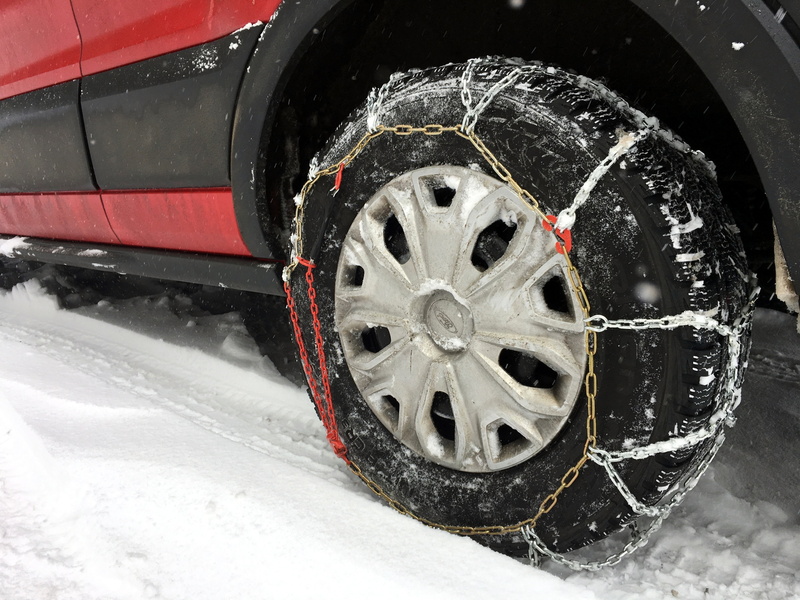 Besides safety, another good reason to consider investing in snow tires and chains is that some states have traction/chain laws, which require them and without could lead to a hefty fine. We briefly thought about studded tires, but decided that they would be overkill. Plus, it is illegal to drive with studded tires in some states, including Michigan! If we need more bite, we can just add the chains. Do you wish you had a toilet in your van? No, toilets take up valuable space, smell bad, and have to be emptied. However, there can be some benefits to having a toilet. 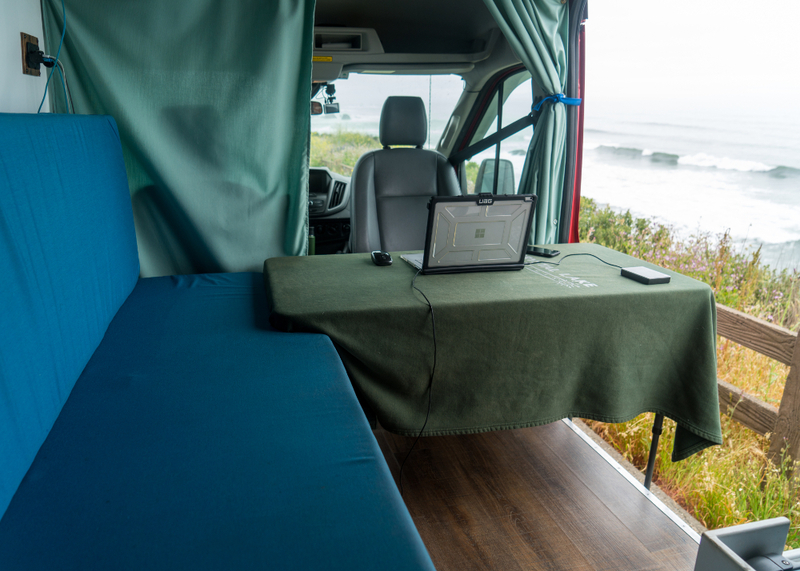 Besides the obvious convenience of being able to go to the bathroom without stepping out of your van, they can allow you to camp in places that require being fully self contained.